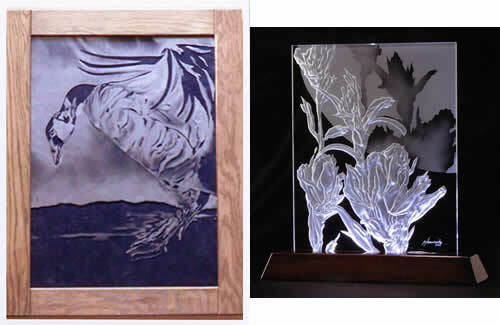 This is a brand new gallery of etched work from our students! You'll find the previous gallery at Students Gallery II. We're proud of our students and their work! Almost a third of the artists featured in our full color book, Etched Glass: Techniques & Designs (now in its 3rd printing), are either former students or have used our books and videos. Some of their work is featured in our student gallery as well. We still are looking for publication quality photos (transparencies, digital) from glass artists who use etching techniques to contribute to their artwork, whether they are a former student or not. We can use these photos in future publishing projects, with full credit to the artist. Danielle Grissom carved this striking Indian headdress in glass several months after taking one of our Professional etching seminars. 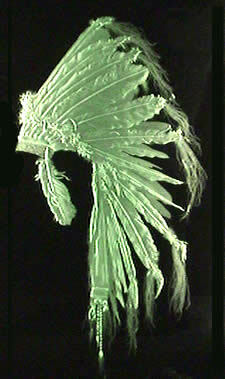 The heron is multi-stage carved and the faces are etched and airbrushed, by Paul and Jordan White. 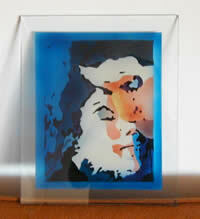 They have taken many classes from us, including How to Color Etched Glass. 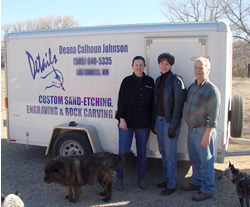 Deana Johnson has gotten into glass etching and rock carving bigtime - with her own custom trailer to go to onsite jobs. She also has a retail store. She has even come back several times to work with us as an assistant on large projects. Seen here flanked by Norm and Ruth. Stone and glass seem to be a good combination of products for certain people! Larry Ford is one of them. 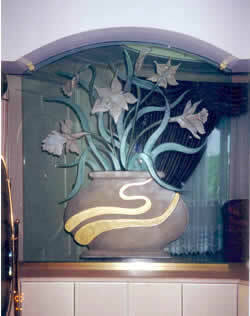 Above left is an underwater scene that is multi-stage carved, while above right are a pair of glass panels for double doors that are reverse surface etched. In the middle is a piece of sandstone, carved and color filled. Miriam deRojas, from Panama, created this multi-stage carved design on mirror, then color filled the carved areas. 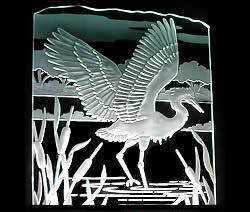 PJ Lenorowitz creates her own original (copyrighted) designs in glass. Left, a Canadian goose is etched with the shading technique. On the right, an Indian paintbrush flower is created with a combination of multi-stage deep carving and shading. It makes a striking piece displayed on a lighted base.